Shirts With Random Triangles: Houston announces Tom Herman's departure, appoints DC Todd Orlando as interim head coach. The school also announced defensive coordinator Todd Orlando would serve as interim head coach. Houston is currently 9-3, and is bowl eligible. Here is the statement from the school in full. “In his short time in Houston, Tom Herman elevated the Houston Football program to new heights, and we are grateful for his contributions to our program. The entire University of Houston community wishes he and his family continued success in this new chapter in their lives. “We will immediately turn our focus to identifying the next leader of our program. We are confident we will find the right individual who will support the young men who are and have committed to this program and who will also support our mission of building Champions for Life, both on and off the field. “With a Tier One University, fertile recruiting ground, upgraded facilities including a new indoor practice facility slated to be completed next fall and a roster full of driven and talented student-athletes, the next leader of the Houston Football program will have an outstanding opportunity to compete for championships, maintain our program’s national prominence and continue the H-TownTakeover. 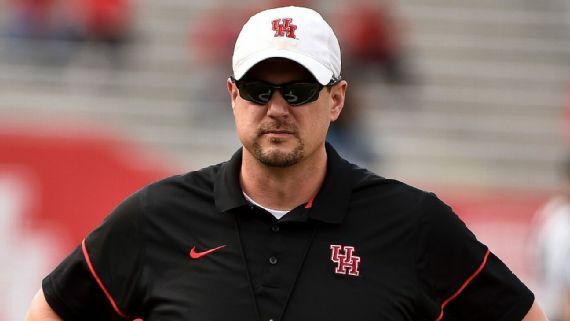 Houston defensive coordinator Todd Orlando will serve as Houston’s interim head coach with Houston’s bowl announcement expected on Dec. 4. Orlando, a Broyles Award nominee, has over 21 years of coaching experience including 12 as a defensive coordinator." Herman has reportedly been hired to replace Charlie Strong as the head coach of Texas.